This is the third post in our Guest Experience Bootcamp series. Subscribe to receive updates straight to your inbox. Human psychology plays a huge role in creating a memorable dining experience for your guests, and I'm not just talking about menu psychology. As humans, we have an innate yearning to belong, to be a part of something, to be accepted. We look to satisfy this need by building relationships – and strong ones at that – with family members, peers, colleagues, and even the businesses we support. If you've found you're having a hard time growing your restaurant's base of repeat guests, you may be focusing too much on "the customer" and not enough on the person behind the term. Your guests are people before they are customers, after all. Finding ways to appeal to their basic needs and preferences — like the desire to be welcomed and accepted, and the widespread preference for convenience and simplicity — will unlock the secret to effective and profitable restaurant customer engagement. What Are The Biggest Restaurant Customer Engagement Mistakes? 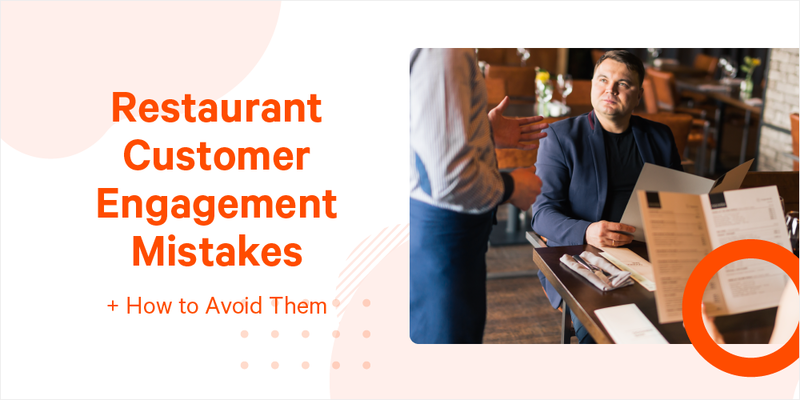 In this post, we cover three of the biggest restaurant customer engagement mistakes and provide educated recommendations for restaurant technology solutions that will help you avoid them. Before we get into the nitty gritty, if you'd like to learn more about the what, why, and how behind restaurant customer engagement, click below to watch a recent webinar we hosted with our friends at OpenTable, How to Enhance Your Restaurant's Customer Engagement Strategy. Imagine walking into your favorite bar or restaurant and being greeted by name, asked how your family's doing, and then served up your regular drink of choice. Nice, right? That warm and fuzzy feeling of being recognized and acknowledged is a huge part of what we in the biz know as hospitality. As Restaurant Consultant and TEDxBend Presenter, Anna Dolce, says, "Service is what we do for our guests; hospitality is what we do with them." The hustle and bustle of a busy shift can make it easy to skimp on hospitality for the sake of efficiency, but actually, that's what your guests came in for. People don't visit a restaurant just for the food, they go to experience a warm, welcoming environment with killer ambiance where they eat like a king (or queen) and get treated like one. With the lengthy list of responsibilities you and your staff are faced with managing during any given shift, how are you supposed to find the time to connect with each and every guest personally? How Can Restaurant Technology Help? 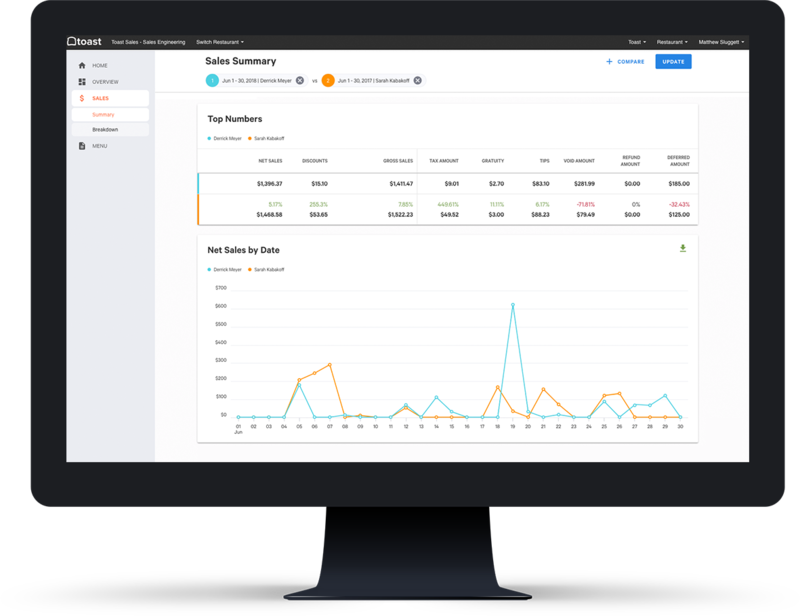 TableUp is an all-in-one customer engagement platform that optimizes every touchpoint a customer has with a restaurant, whether they're checking out your social media marketing materials online or physically dining on-site. From marketing to new customers, to host stand management, to coordinating your restaurants' loyalty/rewards programs, TableUp helps restaurants personalize the way they connect with their customers to increase guest retention and, most importantly, revenue. As my mother likes to say, the secret to any great relationship is communication. The warmth and hospitality you show to guests isn't confined to the four walls of your restaurant; delight your guests with consistent communication by investing in a restaurant CRM, or customer relationship management, platform. The best restaurant CRM platforms integrate directly into your restaurant POS system, allowing you to quickly and easily access important information about your customers' behavior. This information can then be used to better personalize how you connect with your guests about upcoming promotions, events, and updates about your restaurant. Today, the on-demand lifestyle reigns supreme and we've been conditioned to expect the world to follow suit. Our packages arrive in two days or less, we binge entire seasons of TV shows instead of waiting for new episodes to air in the following weeks, and our coffee order is piping hot and ready to be inhaled the moment we burst through Starbucks' front door on the way to work. When dining out, customers expect their experience to play to their preference for on-demand services that are convenient and easy to use. Waiting has become a dirty word to customers, and unfortunately for us in the foodservice industry, waiting is an unavoidable part of visiting a restaurant. During the average visit, a guest can expect to wait for a table, wait for their server to arrive, wait for their drink order, wait for their food order, and finally wait for their check (both to arrive and to be returned). The ambiance could be stellar, your scratch-made dishes titillating, your craft cocktails divine, but if anything "took too long," that memory will stamp out the good and send your guests elsewhere. With over 660,000 restaurants in the United States alone, chances are you won't be seeing them again anytime soon. Time spent waiting is time wasted, both for you and your guests. Reducing waiting periods for your guests positively impacts your table turn time, allowing you to accommodate more parties, increase revenue, and grow profits. Closing out at the bar can be quite the process for both guests and bartenders. Successfully flagging down an already busy bartender to get your card is the stuff of magic; if they can manage to find it within the next 60 - 90 seconds without asking you to spell your last name twice, they deserve a medal. Put an end to the close-out chaos by accepting Rooam at your restaurant. Guests can download Rooam's app, allowing them to see their tab in real time, place orders, and close out seamlessly when they're done. They can even tip, straight from the app! Restaurants can feel safe knowing Rooam integrates with most major point-of-sale companies and offers 100% walk-out protection in the event someone skips out on their bill. The latest innovation in point of sale technology, Toast Go offers restaurants the full, robust functionality of a traditional point of sale system in the palm of your hand. Restaurants using Toast Go have found that servers take, on average, 2000 less steps per night and shave 46 minutes off their table turn time. In the first year of adopting handheld POS technology into their restaurant operations, Odd Duck in Austin, Texas found each server on staff was able to turn their tables one additional time per night, resulting in a $500,000 increase to their annual revenue. Besides their bottom line, the quality of Odd Duck's guest experience was also positively impacted: with staff able to place orders, make adjustments, and take payment directly from the table, they could devote more time to connecting with each guest and building lasting relationships that boosted their overall customer retention. When your restaurant is listed on Google My Business, the site starts collecting data from users regarding their visit. This means Google knows approximately how busy your restaurant is at a given hour. People who search for your restaurant online will be able to see your restaurant is slammed starting at 8 p.m. on Saturdays, and may try to get everyone to meet up at 5 p.m. instead. Did you know 80% of your revenue will come from just 20% of your customer base? On The Toast Restaurant Management Blog, we've talked a lot about the importance of restaurant loyalty/rewards programs and the proven benefits they have for restaurants, including the spending-spike phenomenon they're responsible for creating. If you're not already tapping into the power of incentivization and gamification to grow your base of repeat customers, then go ahead and add this, this, this, and this to your reading list. Alright, now that you're convinced of the power a restaurant loyalty/rewards program wields, here are a few restaurant technology solutions that will help you launch and grow your own program. Paytronix has you covered from soup to nuts when it comes to restaurant loyalty and rewards programs. Not only do they do the dirty work of hosting your restaurant rewards programs, but users also have access to a suite of features that enable you to build stronger relationships with your guests, including email marketing, gift cards, data and insights, and more. One of their more unique offerings is called "comp cards," cards that you can load with a predetermined amount to gift to guests, friends of the company, or even employees. These cards aren't only a great incentivization idea to boost customer engagement, but employee engagement as well. Your staff is the face of your business to guests; by encouraging and rewarding stellar service, you can guarantee your guests will always leave with a great impression of your restaurant's brand, mission, and vision. A restaurant loyalty/rewards solution with a twist, GoParrot leans on the power of AI – artificial intelligence – to help restaurants better engage with their customers. GoParrot's "loyalty and marketing artificial Intelligence platform" gathers data about individual customers' sales behavior, then makes informed decisions about their tastes and ordering preferences. These inferences are used to personalize the messages and promotions you send to each customer to encourage their repeat business. Another bonus of working with GoParrot? They also host and facilitate online ordering programs for restaurants. It's time to move on to the next post in our series, The Guest Experience Bootcamp. If you haven't already check out our first two posts: How To Entice Your Restaurant's Target Customer, and, Yes, We're Open: How To Get More Guests To Enter Your Restaurant. You can still sign up to enter the bootcamp, a week-long email course, below!